I have to say that I am enjoying CUTLASS SUPREME the same way I enjoy the weekly TV shows to which I am addicted. There is that certain something that draws me back, week after week. Such is the draw here...Welcome back to the road trip of bullets, babes, and bad guys! With this episode, I've decided that it is no one particular bad guy that is the star of this serial. No. The star is the Cutlass Supreme and the adventures that surround it, no matter who happens to be in the driver's seat. Yes, without a doubt the hero of our story is a shiny, red Cutlass Supreme 442 convertible. Who is the next to find the keys and take this baby for a spin?Sometime in the next couple of weeks, we will find out more about the bad guys and the car.Phillippe Diederich sent me a copy of CUTLASS SUPREME III for review. Phillippe Diederich - Phillippe Diederich is the author of the Young Adult novel "Playing for the Devil's Fire," Cinco Puntos Press, 2016, and "Sofrito," Cinco Puntos Press, 2015. 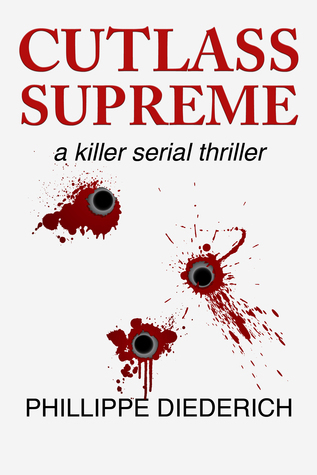 He is also experimenting with the serial thriller "Cutlass Supreme" which is available for Kindle.